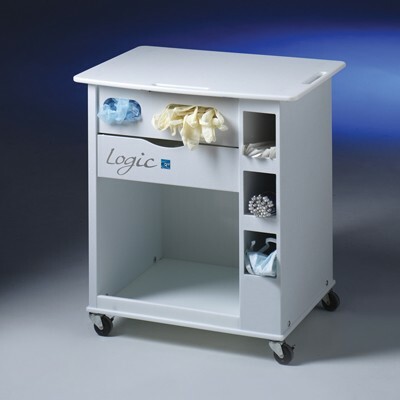 Logic Cart, specifically designed to provide convenient storage of supplies commonly used in biological safety cabinets. 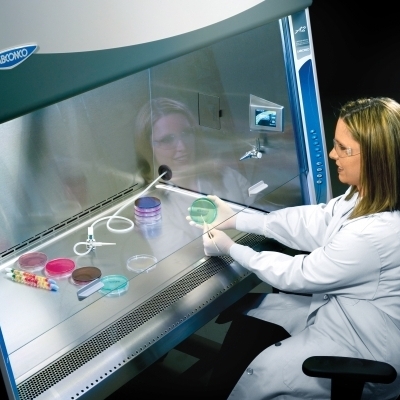 Its compact size allows it to fit easily under Purifier Logic Class II Biosafety Cabinets and PuriCare Procedure Stations mounted on Telescoping Base Stands adjusted to any height. Two inch diameter casters and front and right side handle cutouts allow the cart to be easily moved to within reach while the user works. Three right side compartments accommodate pipettes and other supplies. The top left side compartment with front panel cutouts accommodates boxes of wipes and gloves. The drawer holds a variety of miscellaneous small instruments and supplies. An open storage area holds larger equipment and supplies. 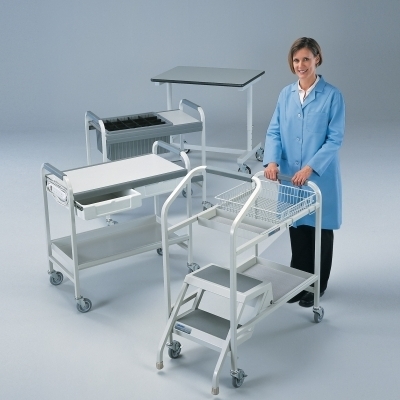 The 25" w x 19" d work surface and cart bottom are constructed of corrosion-resistant white high density polyethylene that is easy to clean. Remaining components are constructed of corrosion-resistant white ABS.